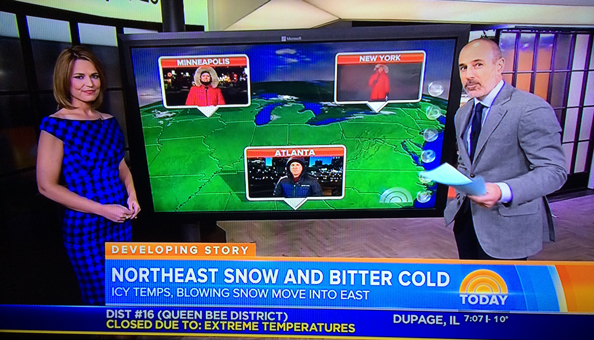 NBC’s “Today” had team coverage of the “arctic vortex” this morning with anchors Savannah Guthrie and Matt Lauer making use of the studio’s touchscreen to virtually take viewers on a spin around the country. The show’s first segment originated from the screen, which is located camera left of the main anchor area. It’s typically used for Al Roker’s weather segments, but is also used for “News with Natalie” during the 9 a.m. hour as well as other segments. Lauer, standing camera right of the screen, was in control and used the on-screen buttons to jump between each of the three live feeds from Minneapolis, New York and Atlanta. Large speech bubble shaped elements with live video feeds were placed on the map, which then expanded to fill almost the entire screen, keeping the location label visible, which was helpful in giving the live shots a bit of context. 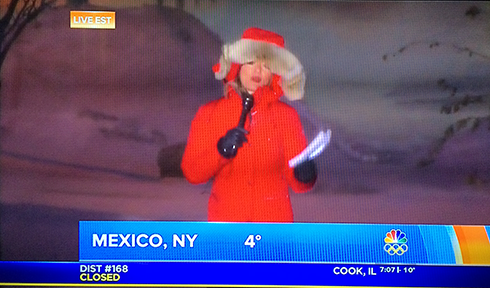 Ironically, just after its Minneapolis correspondent finished reassuring viewers that she was keeping warm by only staying outside long enough for her live shots, it appeared producers kept her standing out in the cold until after the live shot that followed her, as she was still visible on screen when Lauer and Guthrie tossed to Atlanta. 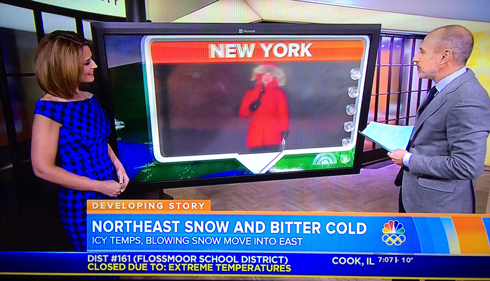 “Today” also made use of its lower thirds by including the temperature at each reporter’s location in them, though Gabe Gutierrez, live from Atlanta, apparently couldn’t resist one of TV news’ biggest cliches and showed viewers a large dial thermometer clamped to a light stand next to him.